You are here: Home » Latest News - Archives » GEAPS Exchange 2018 Tradeshow! TRACTIVE POWER CORPORATION – Will be at the GEAPS Exchange 2018 held March 24 to 27, 2018 in Denver, Colorado. 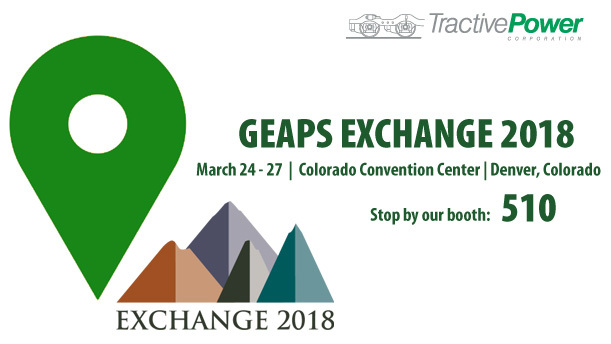 Tractive Power is looking forward to attending the “GEAPS Exchange” 2018 held this year in Denver, Colorado. It will at the Colorado Convention Centre. We will again have a booth (#510) at this trade show so if you have any questions regarding our TP56, TP70, and upcoming new Industrial Switchers, we will be more than happy to answer all your questions. We look forward to seeing you there. Don’t forget to drop off a business card into a draw for a nice surprise gift – no obligation required. Visit the GEAP’s website here for more information: CLICK HERE. For further information about Tractive Power Corporation, contact us through our contacts page: See Contacts for more information. ← MH Equipment Partnership with Tractive Power Corp.